Among those who took part in the Normandy Landings in the summer of 1944 were three brothers from Whitehaven, Cumberland: Robert, Joseph and John Casson. Of the three brothers, only John survived the campaign. Robert Casson (45 Royal Marine Commandos) was killed in action on D-Day, 6 June 1944. Joseph Casson (9th Battalion, Durham Light Infantry) died of wounds on 27 June 1944. They are buried next to each other in Ryes (Bazenville) War Cemetery. In their hometown of Whitehaven there is a memorial tablet in St Nicholas' Church Gardens commemorating those who lost their lives in the Normandy Campaign and later battles in N.W. Europe [Photograph No. 1]. They are also commemorated on the WW2 memorial of St Begh's R.C. Parish, Whitehaven. Robert and Joseph have never been forgotten. On Friday, 6 June 2014, the 70th anniversary of D-Day, family members and friends placed poppy crosses and floral tributes at the memorial plaque in St Nicholas' Gardens [Photograph No. 2]. 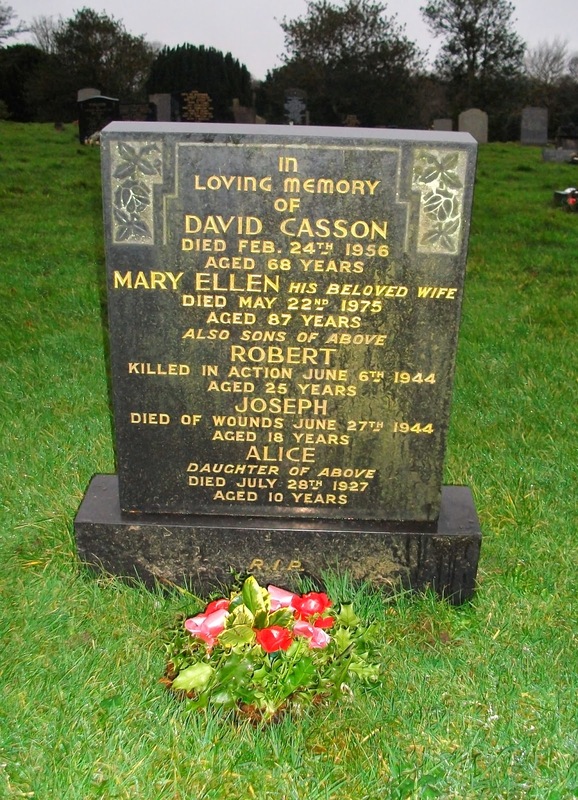 Robert and Joseph, together with their sister Alice who died in childhood, are also remembered on the memorial headstone of their parents in Whitehaven Cemetery [Photograph No. 3]. Gladdened the hearts of those who loved them. They remain forever young but shall never be forgotten." Below are the Commonwealth War Graves Commission citations for Robert and Joseph Cassson who are buried next to each other at Ryes (Bazenville) War Cemetery, Calvados. Regiment/Service: Royal Marines, No. 45 Commando. Grave Reference: IV. B. 2. Grave Reference: IV. B. 1. Photograph No. 4 (above) shows Joseph Casson (left) and Robert Casson (right). These are two brothers who are forever young. They gave their lives so that others may be free.